At Turner Falls Park in Davis, Oklahoma, the IronWolf 700B Slasher mulched 10- to 14-inch trees and crushed the native limestone to three-inch minus to produce an exit road for the park. Since the 1990s, IronWolf has been engineering and manufacturing attachments for land clearing, strip mining and site preparation. IronWolf’s first product, the Crusher, is a multi-purpose cutting attachment designed to mount on wheel loaders and was introduced in Prudhoe Bay, Alaska to process frozen soil. IronWolf’s founders invented the Crusher after years of operating heavy equipment and saw a need for a better way to build roadbeds in the Alaskan permafrost. He designed and built a 10-foot wide cutting head and mounted it on the front of a wheel loader. To drive the 40-inch diameter cutting drum, they assembled a separate engine package which mounted on the rear of the loader and powered the cutting head hydraulically. The first prototype created ideal roadbeds, eliminated the need to rip, haul, crush, and haul material back to the work site, and established the first of many applications for IronWolf’s invention. a wheel loader into a multi-purpose machine. In 2003, IronWolf was asked if the machine could process trees. “I had never tried it, but I felt it was very possible,” said the founder. With a little experimentation and a minor design change, the next product for IronWolf was created, the Slasher, which was originally designed to mount on a track-type tractor with an auxiliary 525 HP engine package mounted on the rear to drive the 10-foot wide cutting head mounted on the front. The cutting head included a hydraulic door and push bar allowing a large exposure for the cutting drum to process trees and stumps. The first Slasher cleared land in northern Alberta, for pipeline right-of-ways and today, many Canadian contractors in British Columbia, Alberta and Saskatchewan are using the IronWolf Slasher for soil separation, land clearing, strip mining, asphalt recycling and excavation. In January 2005, Devon Corporation won the Major Reclamation Award by the Alberta Chamber of Resources for developing a Best Management Practices program for conserving frozen topsoil in the Peace River Arch Region of northern Alberta. Devon achieved this goal by hiring contractors using the IronWolf Slasher to reduce the add-mixing and conserve valuable surface soil. As more contractors and companies started employing better practices to minimize the impact to the environment, IronWolf recognized the opportunity to develop a purpose-built machine incorporating the features and benefits of the Crusher and Slasher while minimizing the environmental footprint. Thus, the 700B concept was born. 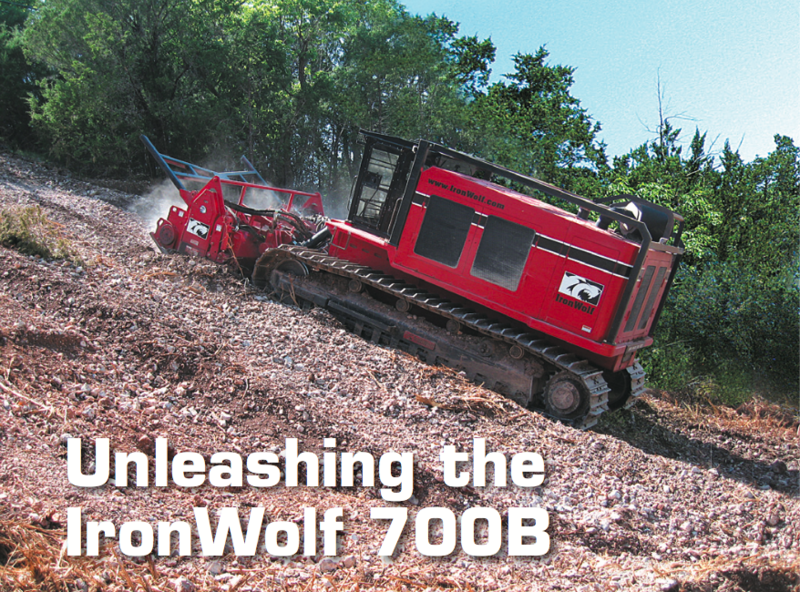 Bringing the 700B to fruition required IronWolf’s president, Todd Howe, to form a design team including Ron Major, Ed Hubkey and Mike Hubkey of IronWolf to specify performance requirements and engineer a tractor to use either the Crusher or Slasher cutting heads. Then, Howe developed a relationship with RWF BRON of Woodstock, Ontario to manufacture the tractor and complete the final assembly of the 700B. “RWF BRON is a World Class Manufacturer that understands the difficult operating conditions and climate in Canada and is the ideal, synergist partner for the production of the 700B,” said David Griffis, Canadian sales manager for IronWolf. IronWolf and BRON completed the final design in 2007, manufactured the 700B in early 2008, and unveiled the machine at the 2008 CONEXPO CON/AGG in Las Vegas, Nevada. IronWolf customers at CONEXPO had the opportunity to tour the 700B and see the 700 hp Caterpillar C-18 engine responsible for driving the 100,000 pound machine. The 700B Slasher uses 36-inch wide, low ground pressure (LGP) tracks to maintain a total ground pressure of 6.8 psi. The 700B has a large, comfortable cab that provides excellent visibility for the operator and allows precise on-the-fly cutting depth control from zero to eight inches. “Functionality and productivity are what we wanted to achieve with the 700B and we now have a machine that is balanced, robust, and diverse which will give our customers a true competitive advantage while minimizing the environmental footprint,” said Howe. After completing its debut at CONEXPO, the 700B travelled to Davis, Oklahoma where it embarked on a one mile road project at Turner Falls Park. 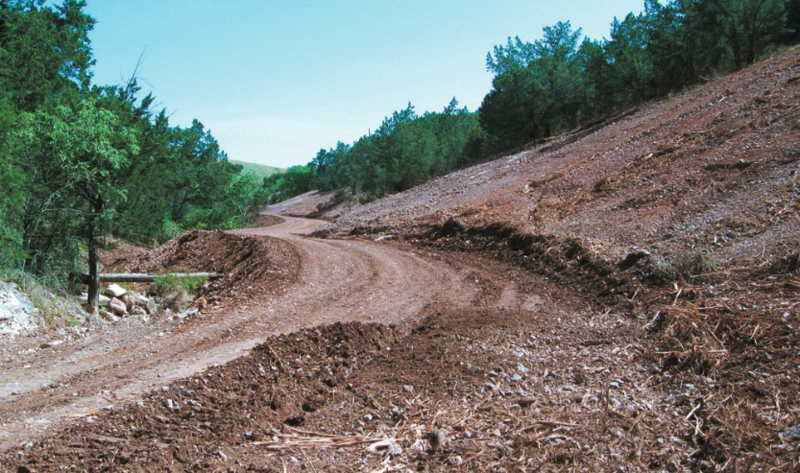 For over 40 years, the City of Davis has wanted to build an exit road for Turner Falls Park, but the traditional techniques for excavation and tree removal such as blasting and burning were deemed detrimental to the environment and the local aquifer. The city hired a local contractor using a 750J dozer, a grader, and IronWolf’s 700B Slasher to complete the job in an environmentally friendly manner. The 700B Slasher traversed 30 percent grades in the park while processing 10 to 14-inch diameter trees. The mulched tree debris was incorporated back into the rocky soil and the 700B crushed the native limestone in the park producing three-inch minus material. The 700B worked a total of 40 hours enabling the entire project to be completed in 80 hours. The innovative techniques of the 700B saved the City of Davis half a million dollars, eliminated blasting, rock hauling, tree burning, and did not negatively impact the local environment. After 80 hours of work, the IronWolf 700B Slasher, a 750J, and a grader completed the one-mile road project on time and saved the City of Davis half a million dollars. The example at Turner Falls is one of many stories that IronWolf expects in the future with the 700B. Howe and his team believe that the 700B will allow Canadian contractors to bid on jobs that they could not have in the past and will add great value to IronWolf’s Canadian distributors. “The projects and environmental challenges will continue to grow and I believe the 700B is the next step toward creating effective solutions while preserving the environment,” said Howe. Starting with one man’s quest to find a better way, IronWolf continues to find solutions to today’s challenges and the unleashed 700B is sure to find a home creating new roads and opportunities for contractors throughout North America.